They’re fighting against austerity and privatization — and for the very idea of public institutions. Manzanares had cut decorative shapes into her bright green union t-shirt, the same one worn by thousands of other striking workers across California this week. The forty-eight-year-old lives in the inland suburb of Dublin, and said that when traffic’s bad she sometimes commutes up to three and a half hours to and from work on the UC Berkeley campus. “The university creates a bubble of gentrification and flushes us out. In order for me to even come to work, I need to pay for gas and my car payments,” she said, balking at the 2 percent raise recently announced by the UC administration in an attempt to put a lid on contract negotiations. The modest wage increase fails to keep up with the skyrocketing cost of living in California. But that’s hardly workers’ only concern: the university is also attempting to raise health care premiums, undermine pensions, and contract out workers’ jobs. The union is therefore demanding not just a 6 percent raise but also a freeze on rising health care premiums, the cessation of the university’s attempt to transition workers from defined benefit pension plans to 401(k)s, and a prohibition on the practice of subcontracting unionized public-sector jobs out to third-party private employees. The University of California is the largest employer in the state, which is itself is the fifth largest economy in the world. If it were a truly public institution dedicated to collective social prosperity, it would see part of its role as providing stable, safe, and desirable jobs that offer a high standard of living to Californians. Instead, UC runs more like a massive private firm dedicated to managing lucrative contracts with third-party companies — and as with any business, one of its primary objectives is to keep labor costs to a minimum. This week, more than 53,000 employees of the University of California have gone on strike not just for a better contract, but to resist becoming casualties in the neoliberal war against the public nature of the university. Campus service workers represented by AFSCME aren’t striking alone. For one thing, the University of California’s operations aren’t confined to higher education: they also include a network of highly lucrative medical centers throughout the state. The union represents not just 9,000 college service workers but also 15,000 medical workers, including vocational nurses, technologists, and radiologists. This week they joined together in common cause, with 24,000 AFSCME workers going on strike on both college and hospital campuses. That number would’ve been impressive on its own, but it more than doubled when the California Nurses’ Association (CNA) and the University Professional and Technical Employees (UPTE) opted to join the strike. Those two unions also represent employees of the University of California — CNA represents nurses in the medical centers, while UPTE represents a range of occupations on and off campus, from pharmacists and lab techs to researchers and IT workers. 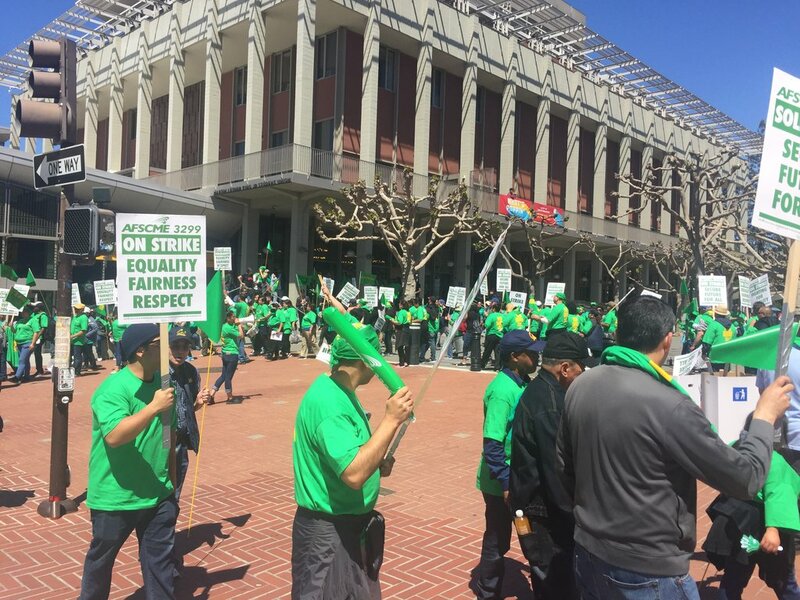 The two other unions are striking with AFSCME as a show of solidarity, and because they’re also in contract negotiations with the university. They know that the outcome of this contract fight deeply affects their own prospects; if wages, benefits, working conditions, and overall quality of life are allowed to deteriorate for AFSCME workers, the others are next in line. Contracting out is just one of many manifestations of the decades-long process of public-sector corporatization. For forty years, the dominant trend in developed capitalist countries (and especially the United States) has been the relinquishment of state responsibility to fund and maintain accessible public institutions for the collective good. Instead, governments have increasingly bought into the idea that capitalist markets can be trusted to efficiently provide everything society needs. As a result, they have been steadily shifting their obligation to educate, employ, and otherwise care for their citizens to for-profit corporations. The result is massive accumulation of wealth by corporate bosses, and worse working conditions and living standards for those who might benefit from dedicated public institutions, i.e., everyone else. In the 1970s, California was at the leading edge of this transition worldwide. As governor in the early 1970s, Ronald Reagan began to cut public funding to the University of California, shifting to a tuition-based model. This led to an avalanche of tuition hikes, which have made the university increasingly inaccessible to working-class Californians. Even so, tuition itself is not enough to float an institution of UC’s size — so it began to look elsewhere for funds, and therefore to prioritize its relationships with the private sector. Over the last forty years, the University of California has gone from being almost entirely tax-funded to almost entirely reliant on a combination of private donations, corporate partnerships, student tuition, and revenue generated by external operations like its medical centers. In 2011, one chancellor called UC a “state-augmented” institution, which sums up the degree of state disinvestment and privatization to date. As the university enters at breakneck speed into partnerships with corporate firms (campus dining, dorm management), fewer and fewer jobs in the UC system are filled by public-sector employees. Contracting out public university jobs plays a dual role: it cuts costs in the short run, and it downplays the social role of the state in the long run. It is first and foremost a way for the university to get out of paying for the hard-won benefits of unionized public-sector workers. But it’s also a means of shifting the responsibility for provision of higher education from the public to the private sphere. Plus, contracting out has the added bonus of breaking the power of the union by decreasing its membership and fracturing the workforce, making it harder to organize against similar attacks down the line. Increasingly, UC workers and students (including the many students who work) are coming to understand that their fates are lashed together, and that the problems they encounter dealing with the UC behemoth spring from the same source: austerity politics and university privatization. At the same time that the university is proposing new tuition hikes — which will be prohibitive for many students, and will saddle others with debt that will follow them around for decades — it is also suppressing wages and attacking worker benefits. Meanwhile, between 2005 and 2015, top administrator salaries grew by 64 percent. “It’s not a lack of funding that we’re talking about here,” said Manzanares. “It’s mismanagement of the money that they do have. They’re allocating it in the wrong places.” The university may be hard-up on public money but it’s still an enormously wealthy institution. It’s just that a great deal of the money comes from its business operations and its sustained courtship of the private sector — and a great deal of it goes to administrators whose job is to facilitate and oversee the university’s privatization. The UC budget is ultimately approved by the Board of Regents, a group made up primarily of prominent capitalists including finance, entertainment, and energy executives who have the final say on big-picture university fiscal matters. As a group they have no qualifications to run a university — unless of course the university is being operated as a large business. And therein lies the problem: the biggest public institution in the world’s fifth largest economy has been nearly entirely stripped of its public character. The various governing bodies of the university are staffed with corporate leaders and their allies, and the institution’s priorities have merged with the priorities of the business community. Meanwhile the state has all but retreated from its responsibility to provide quality, stable, and accessible jobs and education that will guarantee a decent minimum standard of living for its residents. Citing the need for austerity, it refuses to publicly fund an ostensibly public institution, driving the university further into the arms of the private sector. The neoliberal project of subjecting every possible sphere of life to market control has been remarkably successful. The state of California has snatched the keys to the university from the public and handed them over to the capitalist class. But all is not lost: the transformation of the university was relatively swift, and other transformations are still possible. We can imagine another type of institution, one that exists to educate and employ the people of California, not to satisfy the mandates of the capitalist class. We can imagine a university that’s heavily funded by aggressively and unabashedly taxing the rich, and is naturally inclined to treat its workers and students with dignity because it exists to make their lives better. We can even imagine a university democratically governed by workers, teachers, and students instead of an elevated corporate-friendly administrative class — now that would be a truly public university. But we’re a ways off from that dream. For now the task is to fight the effects of neoliberal austerity and privatization wherever they manifest, whether it’s a contract negotiation or a tuition hike, and to connect them to the intentional corrosion of the public sphere in every way possible. The 53,000 employees of the University of California are doing just that: pushing back hard against the tide of anti-worker, anti-student, pro-corporate policies and priorities that motor the engine of the so-called public university today.